These are not your great-aunt Bessie’s dainty tea cakes. Big, chunky and full of nearly everything that makes a cookie good, these are grab-a-fistful-and-carry-one-in-your-mouth-as-well and I like to think of them as zero-sum gain cookies, because they have nuts and oats and dried fruit in them to balance the butter, brown sugar and chocolate chips (only it’s DARK chocolate, which EVERYONE knows is GOOD FOR YOU). I have a friend who’s going through a rough time. Since she lives in Connecticut and I live in Georgia, it’s impossible for me to hold her hand, buy her a coffee, or babysit her kids. That frustrates me because I am a Martha. In Luke 10:38-42 (in the Bible) there’s these 2 sisters, Mary and Martha. Jesus is at the house and Mary is busy hanging out with Him while Martha’s in the kitchen doing all the work and getting annoyed at Mary for not helping fix the casseroles. So now, in Christian churches, someone like me, who prefers to be DOING SOMETHING is called a Martha, and when I can’t DO SOMETHING I get very frustrated. Then The Ladies tell me I should be praying, that *that* is DOING SOMETHING, but I’d rather bake cookies or make a casserole because it’s hard to get past the idea that a tangible result is what’s optimal. And let me tell you what, these cookies are certainly tangible, and I’m sending them to Connecticut. When I bake cookies, I like them crisp, not soft. 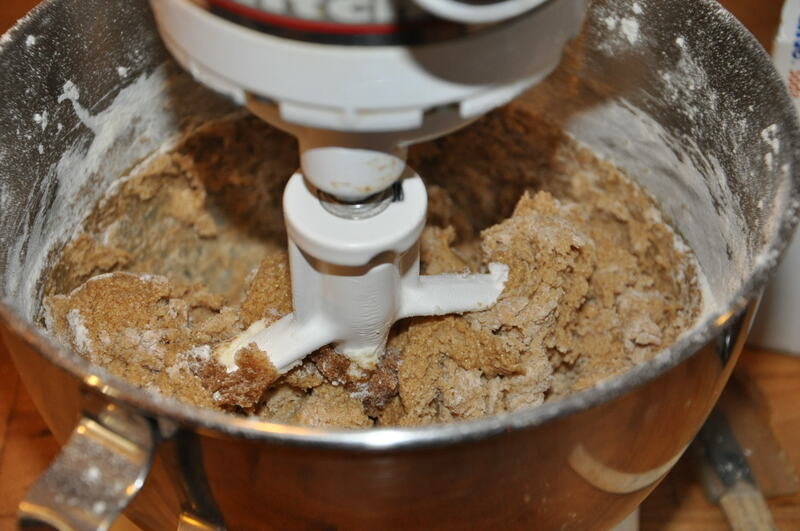 I like to use butter, not shortening, because it adds flavor and is SO GOOD with dark brown sugar. 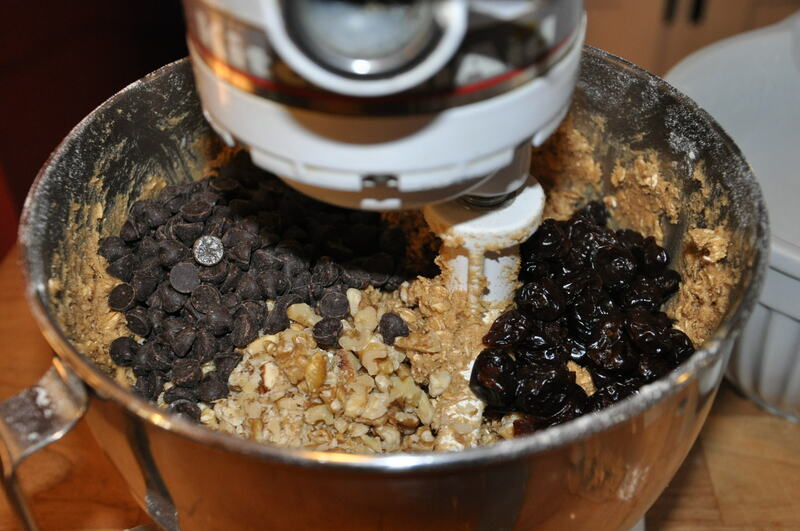 Most cookie recipes call for light brown, and I almost always use dark brown and have been know, from time to time, to even add a swirl of dark (not blackstrap) molasses, because the earthy flavor is SO GOOD. 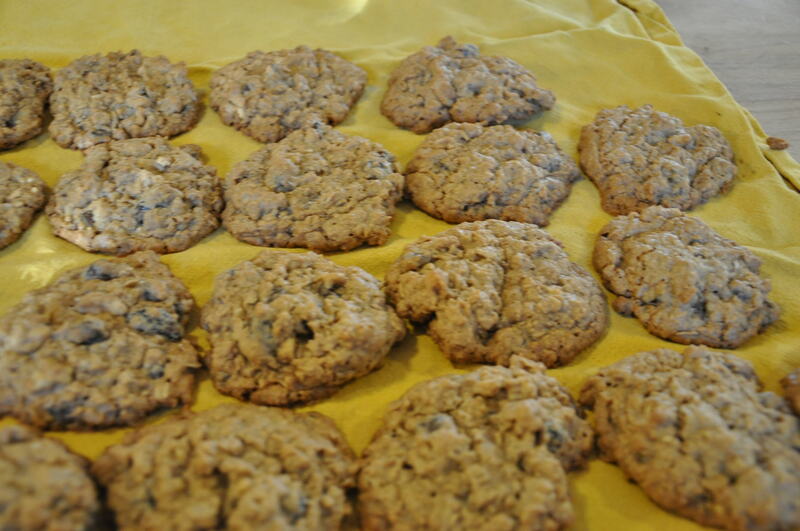 This is your basic cookie recipe of butter, sugars, eggs and flour, with oats and goodies. You can use either vanilla or almond extract and one time I didn’t have either (hush) and used bourbon, which was a totally different flavor but pretty fine in it’s own right. Use whatever kind of nuts you like. My friend requested walnuts, and since she’s a food person too, that’s what I used. Pecans,actually, are my favorite, but I am out of them until I find someone with a pecan tree who’s willing to share. 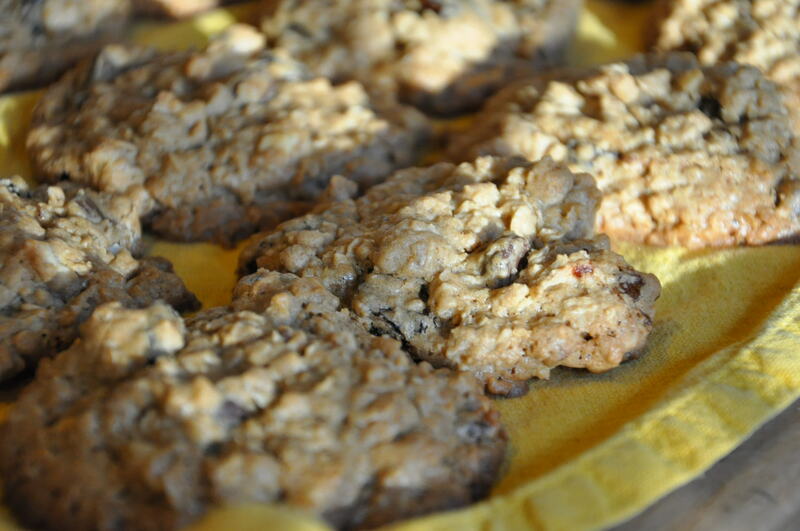 Dried cranberries are excellent,especially if you add a bit of orange zest to the dough. I used dried cherries because seriously, people, DRIED CHERRIES. YUM. 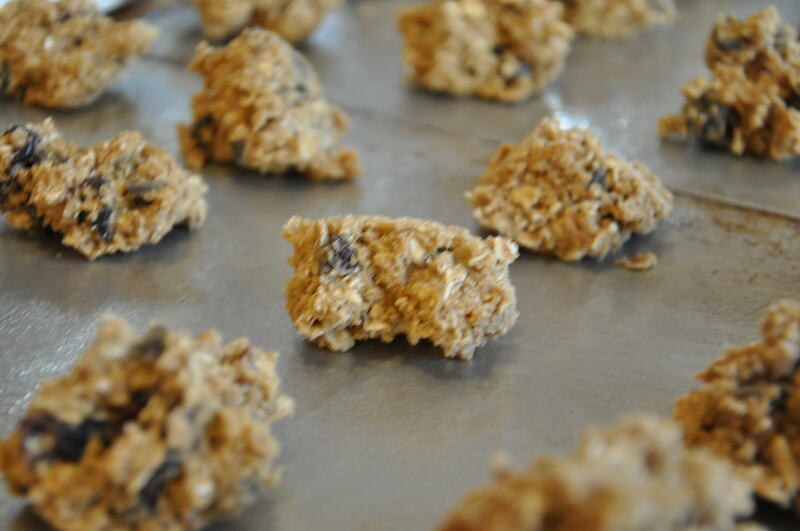 Raisins,of course, are the old standby for oatmeal cookies. But dried cherries…seriously, people, DRIED CHERRIES. Preheat the oven to 375F and grease a couple of cookie sheets. Cream together the butter and sugars. Add the eggs and vanilla and cream some more. Glob onto a well greased cookie sheet about 2 inches apart because they spread a bit. 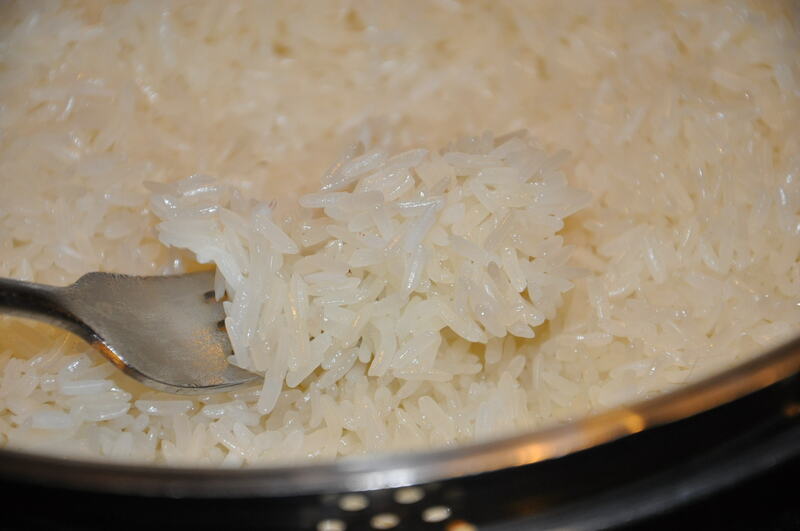 Bake 15-18 minutes at 375F, then immediately remove from the pan onto a towel or rack to cool. I have a request of the 3 people that read this. 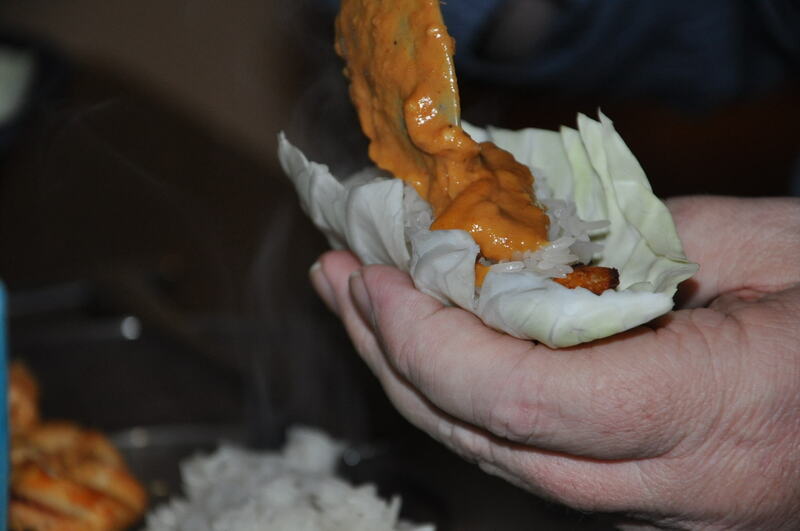 I am looking for cheap, fairly easy, cheap (did I mention CHEAP) recipes that are vegetarian. 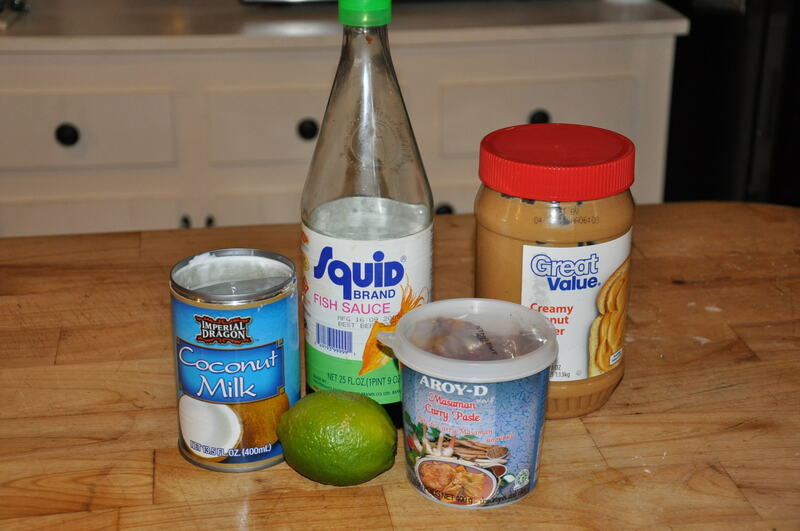 My Son On A Limited Budget has discovered the economical nature of vegetarian cooking, and I am looking for tried-and-true (and cheap) recipes he can fix for himself and his 2 roommates. He recently discovered the delights of 15 bean soup, and said “Mom. For less than $5 I fed all 3 of us and that INCLUDED the loaf of bread I made.” So I’ve cobbled him together recipes for red beans and rice, black beans cooked with beer, and Tuscan white bean soup. Also cornbread (always good with beans), oven fried potatos, and what I call “Cowboy beans”, that is, pintoes with lots of spices and a couple of shots of liquid smoke, since I don’t actually have a dakota hole to cook them in. I am looking for other recipes that involve potatoes, rice, different types of beans and peas, and do NOT require seasonings or ingredients you can’t find at the local Bi-Lo…which essentially means if the name of it has more than one syllable, it probably can’t be found. Unless it’s turnip greens. If you have a particular web site that carries such recipes, I’m open to that as well. I will say this, tho, Lentil Loaf is not a suitable suggestion. However, crock pot cookery is very much suitable! We all have them, those things we gotta have in the refrigerator or pantry in the event some inspiration strikes and we want something for dinner other than Tuesday Night Chicken. Other stuff too, but those are the things I ALWAYS have. There’s a wonderful little Asian grocery in Savannah called Mr. Chu’s that carries all the good things, AND it’s on the same street as Brighter Day, who carries all the other good things! I like to buy things like fresh herbs and roots and berries in bulk, and freeze them right away. I rarely ever use an entire ginger root, and by going ahead and prepping it and freezing, it’s as good as the fresh and not going to waste in the fridge. I can buy huge bunches of the herbs I don’t grow at the Dekalb Farmers Market, and when I get home, I’ll prep and freeze them. There’s nothing like fresh dill on salmon or in refrigerator pickles, and freezing it is a good way to guarentee you’ll have it even in mid winter. What’re your favorite pantry staples? What makes you unhappy if you’re out of it? Did I take pictures? Of course not. It didn’t last long enough. But I am telling you, on a cold, rainy January, when life is closing in and causing anxiety and angst, there’s nothing like a comfort meal for…y’know….COMFORT. Not only is it delicious, it’s easy peasy, using ingredients you can find most anywhere. No fancy herbs. No crazy technique. Just plain old simple food, the kind that has people scraping the pan and thrilled to pieces that there’s enough for leftovers for lunch tomorrow. Beat the eggs and milk together in a large bowl. Stir in the onion soup mix, then stir in the crackers until they start soaking up the milk. With your hands, mix in the gorund meats until everything is well blended. Form into a loaf shape in a casserole dish. Bake at 350F degrees for 1 hour, then top with the ketchup topping, bake for 25-30 minutes longer until the topping starts to get crusty around the edges. 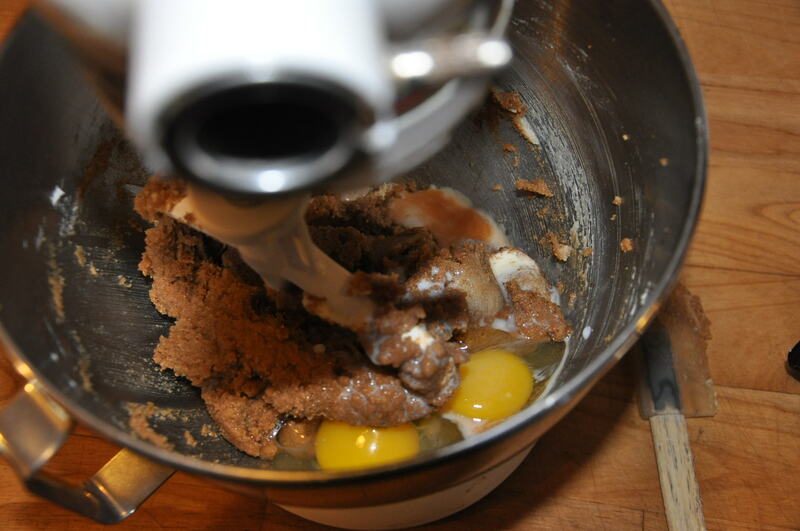 Mix together in a bowl, and spoon over the top of the meatloaf. Cut the potatoes up into small chunks and put in a pot. cover with water and boil for 30 minutes, until the potatoes are done and quite soft. Drain the potatoes and return them to the pot. Cut the butter up into small bits and add it to the hot potatoes. Add about 1/2 teaspoon salt and about the same of black pepper. 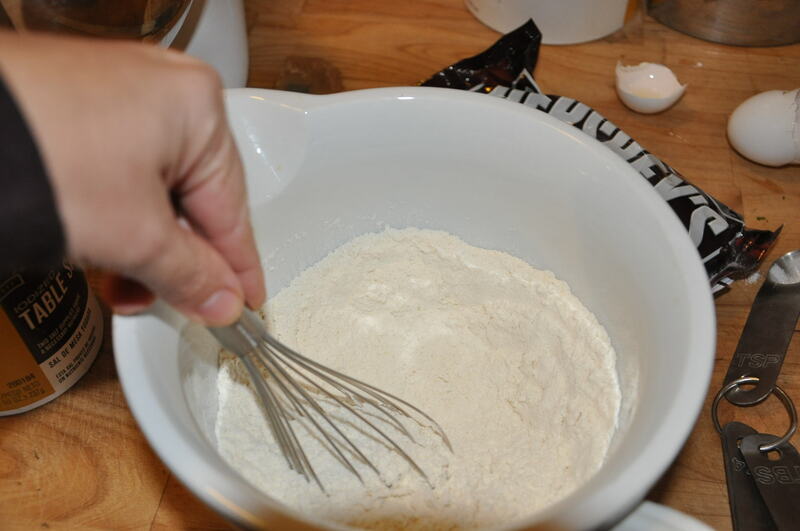 Using a hand mixer, blend in the hot milk, a little at a time, until the potatoes are smooth and thick. Taste and adjust the salt and pepper to taste. Serve hot with the meatloaf for a warm and comforting dinner. People hear “lard” and go into panic mode. “OMG!!! CHOLESTEROL! FAT! DEATH!” but truth is, a biscuit made with lard instead of vegetable shortening (which is hydrogenated and bad for you is soft, fluffy and amazing. Use buttermilk as well and it’s like…perfection. Fry something in lard (chicken, okra,pickles…whatever you like to fry) and with it’s higher flash point it gets hotter than shortening or oil before smoking, and the food soaks up less of it so you end up with a crisp crust and surprisingly less grease to drain off. Plus it tastes good. I figure, since I very rarely fry stuff or make biscuits (not out of laziness but because we are all…shall we say…hm…y’know…not in need of extra poundage,in fact we probably have some to share if you’re wanting any), and lard really makes a superior product in every way, why not use it? Yes, it’s really old school cooking…but fried chicken happens MAYBE once every 3 or 4 months,same with biscuits. So if you’re going to do it, might as well do it right. Now, if you are worried about it, because you’ve never used it, the proportions are exactly the same as if you’re using oil or shortening. 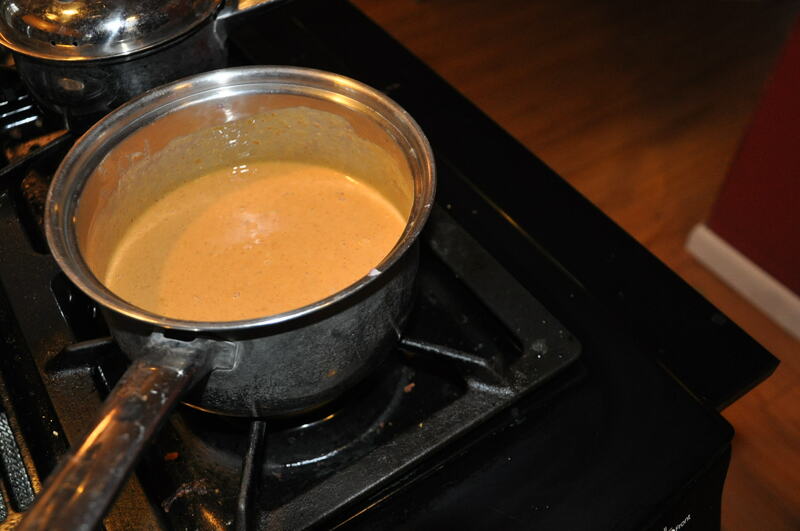 It makes a good roux as well. 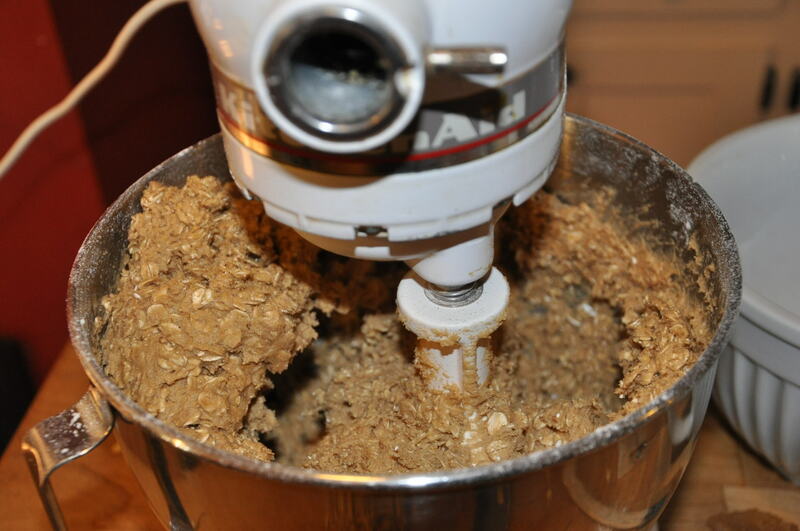 What you’ll wind up with in a quickbread is a slightly softer result. A biscuit won’t quite hold up to cold butter (and yes,I use realbutter not, partially hydrogenated margarine), but if you soften it to room temp, the biscuit will thank you. 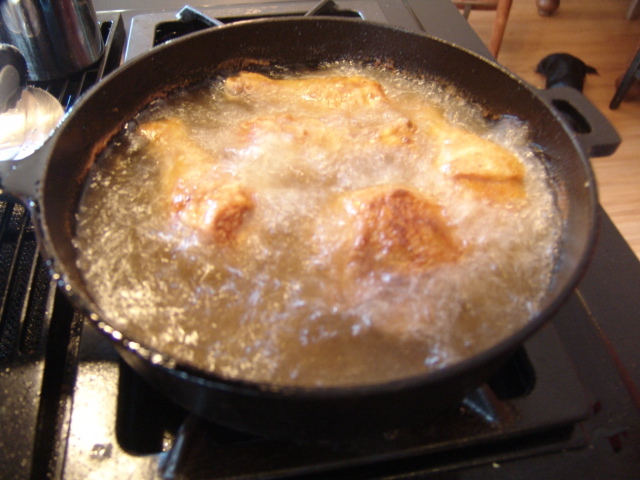 One observation I’ve made about frying with it…and my chemist husband who knows pretty much everything hasn’t been able to tell me why this is so…stuff fried in lard seems to stay hot longer. 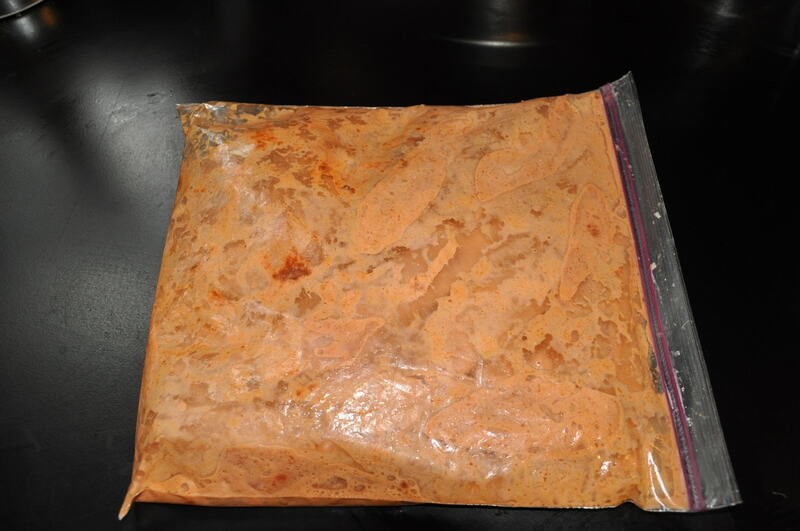 I can cook chicken and 20 minutes after pulling it out of shortening, it’s room temperature, but after cooking it with lard it’s still hot. Can anyone tell me why? Am I just lucky? Here’s a quick recipe, it’s my 19 yr old son CJ’s method for fried pickles and they are…oh SO good. Toss a handful of the pickle chips in bisquick so they’re well coated and let sit for a few minutes before putting them in the fryer. Fry a handful at a time until they’re crispy and golden brown. You don’t want to cook more than a handful at a time because you don’t want them crowded, and you don’t want to put so many in that they drop the temperature of the oil. That would make them greasy. 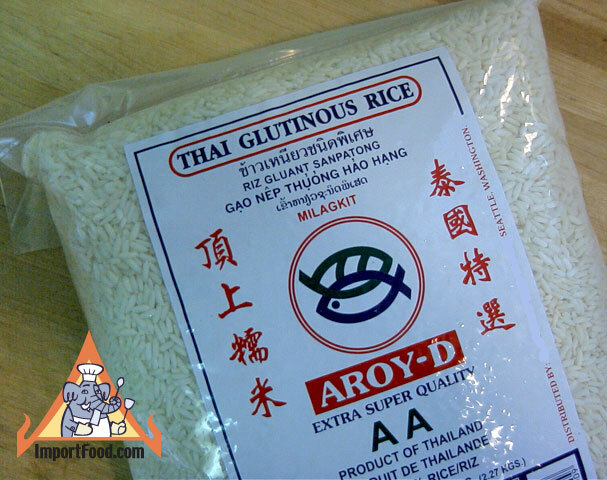 I was scrounging through the fridge, looking for something to fix as a side dish alongside some unremarkable chicken. 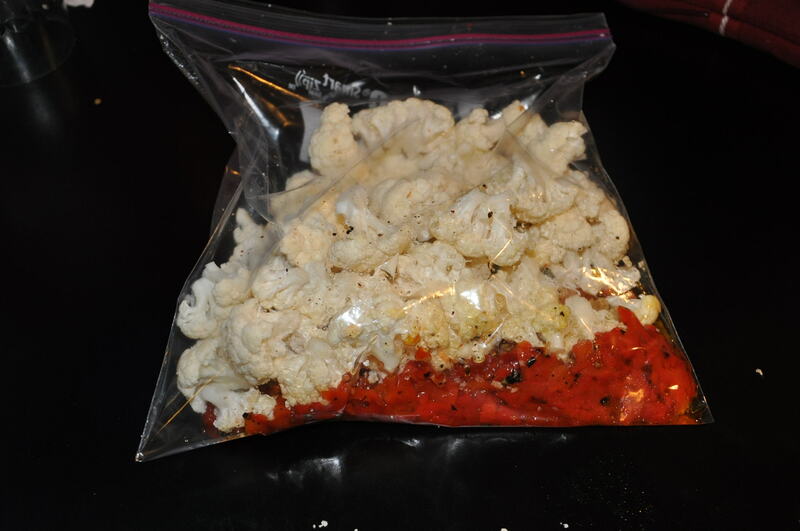 After locating a head of cauliflower, I got online, looking for ideas and came across a recipe for roasted cauliflower. Hm, I thought. I’ve never fixed that before. My prior cauliflower experience involved steaming and mashing it with cream and herbs (a concoction the household heathens labeled “spudge”), and baking it with cheese sauce. 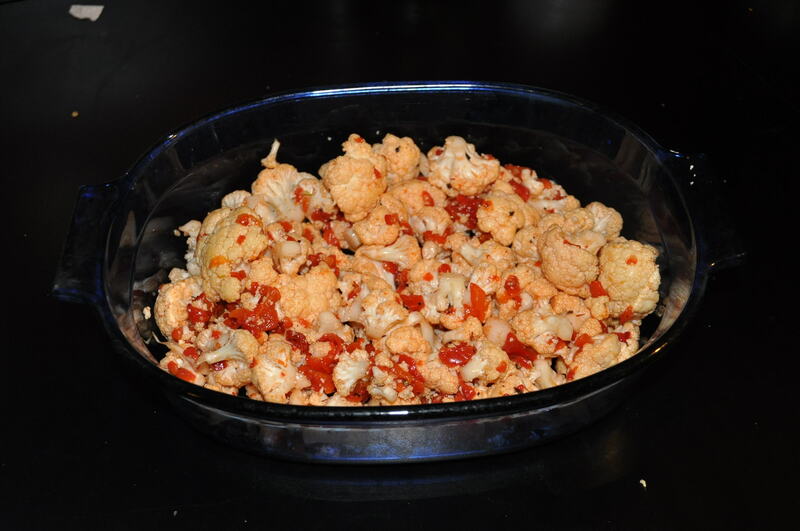 However, in my New Year enthusiasm for all things low fat, I was determined to fix a tasty cauliflower dish that didn’t involve high fat dairy products. Well, as much of them, anyway. 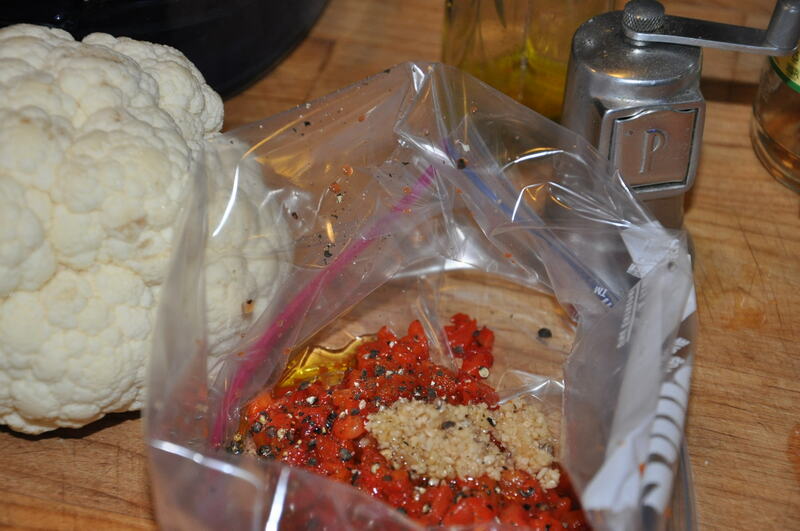 Add the cut up cauliflower. It's pretty already! Mix it all up in the bag and dump into a casserole dish. Bake at 425F for 45 mins, then top with the cheese and broil on low for 5 minutes. The household food critics gave it their wholehearted approval, even the picky one who generally doesn’t like a vegetable unless it’s coated in cheese and cream. I will probably branch out the roasted vegetable concept and see what happens. 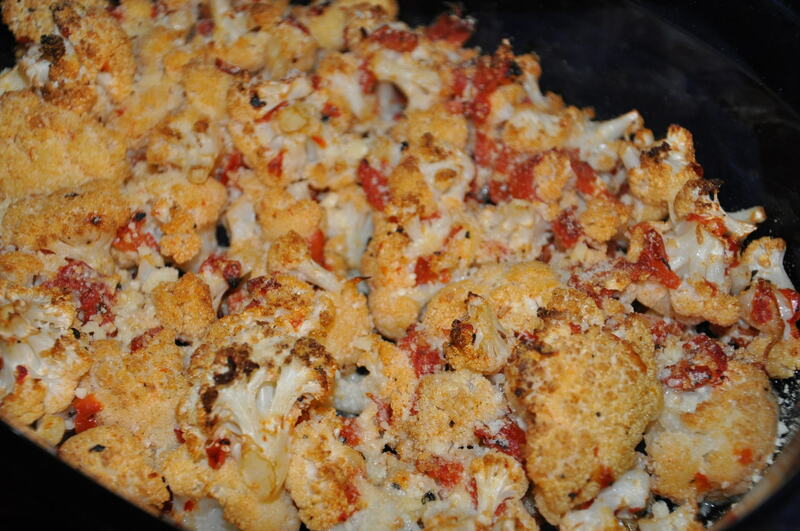 I’ve always roasted root veg, but this is the first time for cauliflower. I’ve heard rumors of roasted broccoli but remain dubious. Myfavorite method for broccoli is a quick blanch then make it into a salad with cheese and bacon and mayonnaise…which probably utterly negates any nutritional benefits, tho I prefer to see it as nutritionally neutral, like drinking water, because the ingredients cancel each other out. I suppose this theory could be applied to cauliflower cheese and such as well.